A few species of spider mites infest strawberries grown on the California coast. 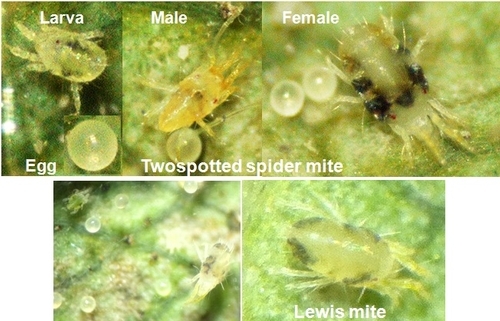 The twospotted spider mite, Tetranychus urticae Koch is a common species and considered a major pest. Lewis mite or Lewis spider mite, Eotetranychus lewisi (McGregor) is another spider mite species that feeds on a variety of host plants was recently found causing heavy infestations in strawberries and raspberries in Ventura County. Both species look very similar in general appearance except that when adult females are compared, Lewis mites are smaller than twospotted spider mites and have several small spots on their body while twospotted spider mites have a single dark spot on either side of the body. 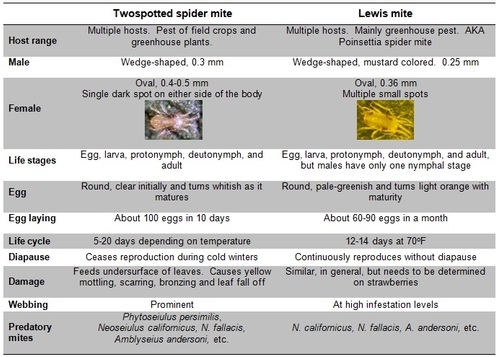 Below are some details to compare these two mites.